You are an amazing realtor! But mostly an absolute wonderful person Gabe is professional, patient, efficient, quick to respond; and puts his clients’ interests far above his own. We would be happy to give Gabe our highest recommendation to anyone desiring to sell their property or buy one. He has years of experience in this market and provides that perfect balance of knowledge, drive and enthusiasm that will get the job done for you. Gabe will remain our agent as long as he is in the real estate business. You will not be disappointed as he is by far the ultimate best agent there is out there. Gabe, you are an amazing realtor, but mostly an absolute wonderful person. Thank you!" I would highly recommend him to anyone who was looking for an agent "I cannot thank Gabe enough for his tremendous effort in the successful sale of my property and purchase of my new home. Not only was I listing in what would be considered the off season (fall/winter) for Real Estate, but I was also selling what would be considered a ‘difficult’ property. Gabe went above and beyond with his marketing strategy and perseverance and was a great advisor and ensured that I was taken care of in all aspects of my sale and purchase. He was always available and responsive and I would highly recommend him to anyone who was looking for an agent to sell or buy." By: Jenny and Clark C.
Our experience with Gabe Kadoranian was a sincere pleasure "Our experience with Gabe Kadoranian was a sincere pleasure. Our search criteria, price point and needs were very specific and within those parameters, Gabe provided us with many suitable options. Not only were we shown everything that we asked to see, but also had the benefit of his input and experience to help narrow down the search field while at the same time, open ourselves to options that we had not previously considered. Gabe’s flexible and accommodating scheduling helped us to view homes when our busy working lives permitted which made the process a lot less stressful. His attention to detail meant that for each home we viewed, Gabe was prepared with the background and pertinent details for that property. His knowledge in things like estimating renovation, paint and update costs allowed us to get a true picture of how each home would work for our family and budget needs. During the purchase process, Gabe was professional, knowledgeable and efficient. He was truly excited for us and happily met with us several times as he walked us through the purchase process, explained and finalized all documents. Gabe assisted us in merging our two households into our perfect and forever family home. 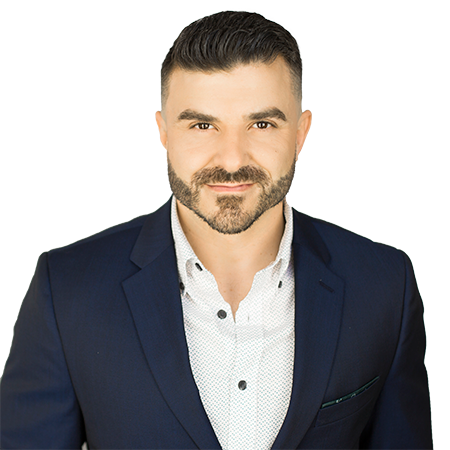 We would happily recommend the services of Gabe Kadoranian to any friends, family or other individuals looking for exceptional Realtor services." Gabe went above and beyond with his marketing strategy and perseverance! "I cannot thank Gabe enough for his tremendous effort in the successful sale of my property and purchase of my new home. Not only was I listing in what would be considered the off season (fall/winter) for Real Estate, but I was also selling what would be considered a ‘difficult’ property. Gabe went above and beyond with his marketing strategy and perseverance and was a great advisor and ensured that I was taken care of in all aspects of my sale and purchase. He was always available and responsive and I would highly recommend him to anyone who was looking for an agent to sell or buy." Thanks Gabe! "As a first time home buyer I was a bit overwhelmed with what I needed to know before I met Gabe. He outlined all the specifics of the process and negotiated a great price on my townhouse. Thanks Gabe, I’ll definitely be giving you a call when I am looking to sell!" By: Erin H. and Matt P.
We truly felt supported by his wisdom and knowledge! "From the initial meeting we had with Gabe we knew he was the one for us. So sure, in fact, we cancelled all other interview appointments with real estate agents that very day. He arrived prepared and really listened to us, and by the end of the meeting we knew he was genuine and sincere in the quest to find us the perfect home for our unique needs. We were most taken back with how honest he seemed and how easily we felt we could trust him. We truly felt supported by his wisdom and knowledge of the housing market. When we started to feel panicked or overwhelmed Gabe was always there to calm us down. I am so glad we had the opportunity to work with Gabe. I don’t know what we would have done without him. We talk often about what a great experience working with him was and how we happily welcomed him into our family. I can’t recommend him highly enough!!" It was a pleasure working with someone who always puts his clients first "Gabe was a professional, dedicated real estate agent who worked very hard to find a home that would be suitable for our family’s unique situation. Finding a home with separate suites can be challenging, and he listened to our specific needs and only showed us homes that had the potential of meeting our demands. It was a pleasure working with someone who always puts his clients first, especially when he had to consider the unique needs of two families purchasing one home. I was impressed by Gabe’s familiarity with the market, and his honest and caring concern for our family. I would definitely seek Gabe’s expertise if I am ever in the real estate market again." One year later, we are still as happy! "Gabe was a pleasure to work with! He was honest, thorough, and really fought to get us the best possible price! One year later, we are still as happy with our home than the day we moved in. We highly recommend Gabe K for buying or selling a home!" Gabe made it simple and painless! "Being a newcomer just going 2 years as a permanent resident, I was very anxious to get a place I could call my own. I was a first time home buyer as well so I definitely had no knowledge about the process. Gabe made it simple and painless. He did his best to guide me to end up with the best choice of home there is, given my budget. I am so happy with my 4 bedroom townhome. Thanks so much, Gabe! Our next target soon: upgrading to a fully detached home!" His attention and availability was remarkable as he was always there to answer our questions "Years before I put my condo on the market, I knew I wanted to work with Gabe Kadoranian. Gabe’s knowledge of the real estate market was so in depth and he helped us really understand everything we needed to know. Gabe really delivered on the sale of our condo. We gave him a timeframe that we wanted it sold by and he delivered way before our expectations. His marketing technique is very successful. He catered his very own marketing strategy which best suited the sale of the condo. His attention and availability was remarkable as he was always there to answer our questions in detail. Not only was Gabe professional, but he is also very personable and down to earth. Thanks for everything Gabe!" Gabe truly put my needs and wants first and foremost "The whole buying and selling process can very daunting and overwhelming, yet Gabe made it so simple and stress-free. He listened to my concerns and addressed them with knowledgable and timely responses. Gabe truly put my needs and wants first and foremost. I listed, sold and bought my home all in less then a month and have no doubt that things went so smoothly because he knows the housing market and genuinely cared about what I wanted. I’ve dealt with many realtors and most have left a bad taste in my mouth, because I felt they were solely concerned about “the sale”. It couldn’t be further from the truth with Gabe, he was fair, professional and had my best interest at heart at all times. I would highly recommend Gabe to all my friends, family, colleagues and strangers on the street, as I know I will definitely be using Gabe in the future for all real estate matters!!!" He delivered way before our expectations! "Years before I put my condo on the market, I knew I wanted to work with Gabe Kadoranian. Gabe’s knowledge of the real estate market was so in depth and he helped us really understand everything we needed to know. Gabe really delivered on the sale of our condo. We gave him a timeframe that we wanted it sold by and he delivered way before our expectations. His marketing technique is very successful. He catered his very own marketing strategy which best suited the sale of the condo. His attention and availability was remarkable as he was always there to answer our questions in detail. Not only was Gabe professional, but he is also very personable and down to earth. Thanks for everything Gabe!" I love my condo and would highly recommend Gabe to anyone looking to buy or sell a home! "Working with Gabe to find my condo was a great overall experience! He had a great attention to detail and explained the documentaion thoroughly. He also listened to my needs and made sure that we saw the right places which allowed me to find the perfect place in a short time frame. I love my condo and would highly recommend Gabe to anyone looking to buy or sell a home!" Gabe was extremely helpful in finding our family our first home! "Gabe was extremely helpful in finding our family our first home. He helped to make the jump from renters to homeowners easy and stress free. He quickly kept us updated on new homes on the market. I would highly recommend him to anyone who is looking for a home of their own." Gabe was honest, knowledgeable and fun to work with! "Gabe was honest, knowledgeable and fun to work with! Couldn’t be happier with the townhouse he found for my girlfriend and I. Thanks again Gabe!" We would most certainly recommend and use Gabe in the future "We would definitely recommend Gabe Kardoranian to be your Realtor. First and foremost we found Gabe to be well versed with the realty market and its activities. He listened to our needs and took the time to find the house we were looking for. Knowing his excellent work ethics, negotiation skills, patience and the time he devoted we would most certainly recommend and use Gabe in the future." We would be happy to give Gabe our highest recommendation! "Gabe is professional, patient, efficient, quick to respond; and puts his clients’ interests far above his own. We would be happy to give Gabe our highest recommendation to anyone desiring to sell their property or buy one. He has years of experience in this market and provides that perfect balance of knowledge, drive and enthusiasm that will get the job done for you. Gabe will remain our agent as long as he is in the real estate business. You will not be disappointed as he is by far the ultimate best agent there is out there. Gabe, you are an amazing realtor, but mostly an absolute wonderful person. Thank you!"